Over the past thirty plus years, the greater Tucson area has seen a tremendous amount of growth. In 1985, the population of Tucson was estimated to be around 365,000, and the latest estimate is somewhere around 525,000 with the Tucson region estimate at over one million people. As you can see, this area has grown quite a bit. Also, in that time, there has been much creation of new businesses in and around Tucson and the suburbs of Oro Valley and Marana. Now, whether your particular company is engaged in the construction industry as a General Contractor or as a artisan/sub-contractor, a retailer, product manufacturer or distributor, web or app designer, health care field, consultant, or one of the hundred different fields that conduct business in the greater Oro Valley, Marana, or Tucson area, one important step in keeping your company safe and viable is having the necessary insurance coverage. If your company is in the construction industry, whether your business is building new custom homes, renovations and remodels, or doing commercial builds or tenant improvements in Tucson, Oro Valley, Marana or anywhere else in the Tucson area as a General Contractor or as a artisan/sub-contractor, the professionals at PJO Insurance Brokerage can assist you in obtaining insurance coverage to fit your company’s needs including General Liability Insurance, Workers’ Compensation Insurance, Pollution Liability, and Inland Marine, which are just a few of the insurance coverages available for your construction company. If your company is a Manufacturer or Distributor of products in the health, diet, energy, industrial, medical, or one of the many different industries out there, PJO Insurance Brokerage has numerous Product Liability markets and can assist you in finding the proper insurance coverage to protect your Tucson or Marana company. If your Arizona company provides a professional service in the areas of Management Consultant, Web Designer, Event Planner, Media Consultant, Project Manager, or one of the countless other companies engaged in the business of advice, expertise, or professional services, then having the proper coverage could help protect your company should a lawsuit or claim be filed against it from a client alleging a negligent act or an error or omission by your company. PJO Insurance Brokerage has several markets for this type of coverage and can assist you in finding the proper coverage for your particular needs. If your Tucson or Oro Valley, Arizona company has a board of directors, then it will be vital that you secure Directors & Officers Liability Insurance Coverage. This particular type of professional liability coverage will provide protection in the event of any alleged or actual wrongful act, misleading statement given, breach of duty, or omission by your board of directors and officers. This coverage will apply to directors and officers of for-profit companies, educational institutions, and nonprofit companies. If your Marana, Tucson, or Oro Valley, Arizona Company has any presence on the web, including Twitter, Facebook, LinkedIn, or a Company Blog, and conducts transactions on the web, keeps credit, debit, or customers’ vital information, then your company should have a Cyber Liability Insurance Policy. 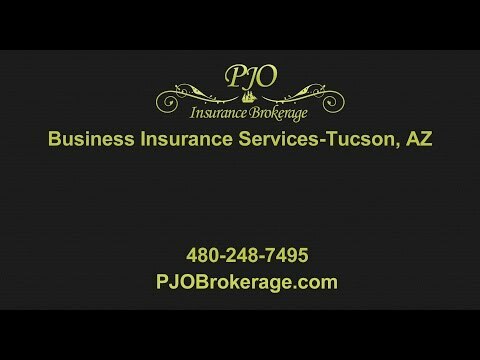 Here, at PJO Insurance Brokerage, we understand that with the current market, new and exciting companies are being formed each and every day in and around the Oro Valley, Tucson, or Marana, Arizona area, and, as such, will each require their own specifically designed insurance program. PJO Insurance Brokerage has the expertise and experience to put the proper insurance program together for your company’s particular needs. We look forward to working with you in the near future.